Baked chicken breast is one of the simpler meals that I make quite often. This quick recipe is one of my go-to meals whenever I'm in the mood for something simple. Pre-heat oven to 450 deg F.
Line baking sheet with aluminum foil for easier clean up. Spread 1 tbsp of olive oil. Lay down chicken breasts. Sprinkle salt & pepper and garlic powder to taste. Flip chicken breasts and sprinkle seasonings to the other side. Bake in oven for 20 minutes. Flip chicken and bake for another 15 minutes. 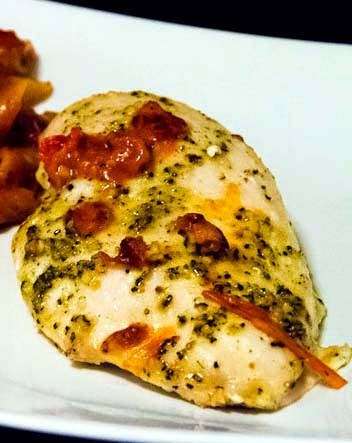 We ate these chicken along with penne pasta in arrabbiata sauce, also an easy meal to make.